Hone your decisions and actions on the journey to your desired stage of business growth and leadership. Our comprehensive business development programming gives your the knowledge and tools to take your place in your industry, markets and networks to achieve your goals and fulfill your mission. The picture to your right is of a graduation event for CEO leaders. Our interactive programs combine business growth knowledge and proven practices with individualized advising tailored to your learning and leadership style. Lead your company to your desired level of revenue growth. 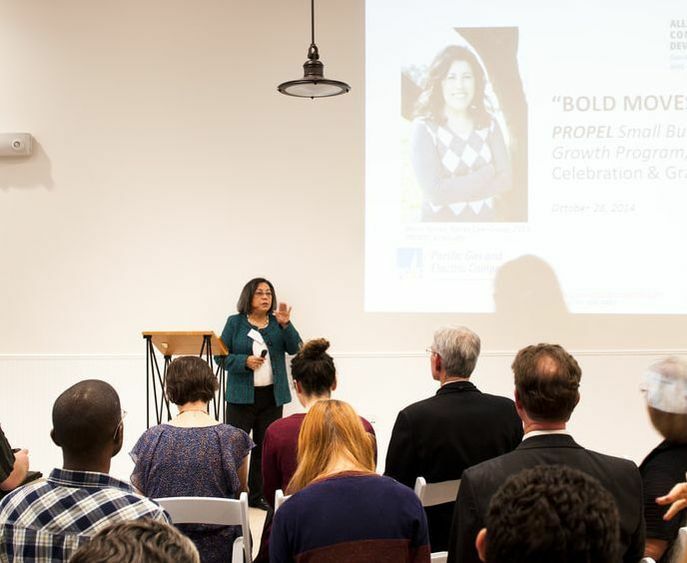 Build your company tool kit to make the journey toward $1 Million or recognize you could take your business to Mid-Market levels beyond $10 Million. Darlene thinks out of the box and stimulates you as a workshop participant to do the same. She gets to the root of “what are you selling” and enables business owners to define their own unique strengths–and in do doing, urns the lens through the client’s eyes. The gift is that “aha” moment, where we can see ourselves from a new distance. I recommend her work! Learn how to think like the owner of a $1M-Plus business. Audience: Owners highly motivated to grow their businesses seeking relevant practices and advising to achieve desired results. For example, businesses plateaued at $350,000 – $900,000 in revenues, restructuring, launching new business lines or products. The program has elevated our business beyond just a more competitive architecture firm, we have developed skills in the program that have elevated us as a visible business on every level. Our goals are not longer to just maintain but to grow, create jobs and make a place in the Oakland community. Contact Darlene Crane to discuss your business operating and growth needs. Get more information on this program, scheduling and other specifics. Don’t chase money! Focus on building a solid business so funding sources can say YES! In this program gain the deeper knowledge of the financial sector to find the right sources and work with them to obtain adequate funding. Know the questions to ask to find the financial professionals who want to help the non-traditional entrepreneur. Then orchestrate your entree into the sector and financial networks. As you prepare for the funding process it will help you improve how your business works to produce solid financial results. By participating in the program Winning Strategies was able to be much more competitive in the bidding process. By clarifying the value proposition of the company … we were able to partner with a leading prime contractor to win the redesign of a major public agency website. We are now responding aggressively to RFPS for larger opportunities. Product Development and Market Success! Use the product practices and tools that deliver good revenue. Product Development is one of the most powerful and complex growth strategies. The development process alone is a major investment in time, money and resources with market risks. About 45% of product development efforts are successful, meaning meeting sales targets at launch or at a level acceptable to management. As an independent business you don’t have the big budgets and reserves for big delays or mistakes. This program is designed to help you increase sales of existing or new products. Know how the professionals increase their probability of product success to 60/40, 80/20 and 90/10. Practice using the tools that validate product market value through development, launch, and post launch refinement. Learn which RFPs are worth bidding on. Stop being overwhelmed with bidding and learn how to say “no” to RFPs wrong for you. Build compelling value propositions that increase visibility to attract and win more ideal clients. If the majority of your sales are with corporations learn how to be in the top three bidders for the good contracts. Contact Darlene Crane or call 510.908.0762 for program description and other details.